The famous Dean Martin song is played in many romantic movie and television scenes. No doubt Italian is one of the most beautiful languages in the world. At times, you may have heard some people wanting to learn the language, too. I have always had a fascination for languages and, in particular, Italian. However, at the schools I attended, they did not offer Italian. I knew one day I would learn Italian, but I did not know when or how. Rosetta Stone was a game changer for me. Learning a new language can be very exciting for some, but it can also be intimidating for others. Learning Italian was so much fun, easy, and addicting with the Rosetta Stone program. Though I wanted to learn the language just for fun, I did not know it would play a big role in my life during the years to come. Follow along as I discuss my Italian language journey using Rosetta Stone and how it also led me to find amore. I began to learn Italian in 2007 and quickly fell in love with the language and culture. 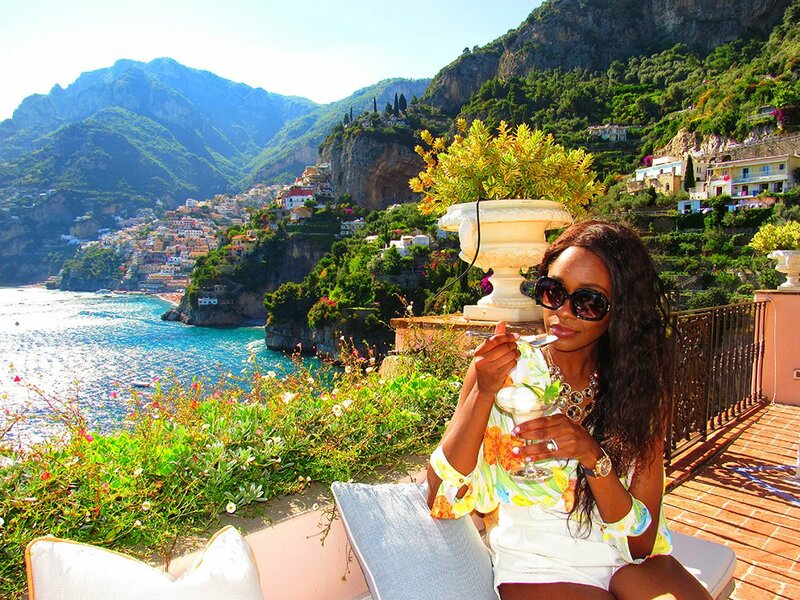 I traveled to Italy every summer since 2009 and gained so many wonderful friendships. Through those friendships, a special relationship emerged. I lived in Italy for a few months in 2010 and it was very hard to leave Italy and all the wonderful friends, food, and scenery. I kept in touch with many of my Italian companions via social media and Skype so I would not lose the language. In February 2011, a big group of my Italian friends did a trip explore all of Florida. I met up with them for the Miami portion of the trip. On this trip, I met my now-husband Saverio. Though he spoke some English at the time, we were able to communicate in Italian on the trip. It was not love at first sight, but there was definitely some interest there. After the trip, we kept in touch on Facebook and then soon decided to pursue a long-distance relationship. It would definitely be a challenge with the distance between us and the time difference of 7 hours, but we were determined to make it work. We had our weekly Skype dates on Sundays, which, of course, including speaking Italian. We hardly ever spoke in English then––it’s weird and informal to us. Even to this day, we mostly speak and text in Italian. He too was impressed with the way I spoke the language. During the two years of dating, we would take turns visiting each other. I will go to Italy and then he would come to the U.S. He is from southern Italy in the region called Calabria. Very few people speak English in the south and mainly speak Italian or in dialect, which at first I could not understand, but after some time, I was able to understand better. The “Italian mama” was pretty much just like movies: very loving, loves her sons, and loves to cook and eat. All the Italian moms wanted to fatten me up. Mangiamangia! they would repeat. After dating for a year, Saverio proposed to me in Dallas in April 2012 by putting the ring in my wine glass at dinner. 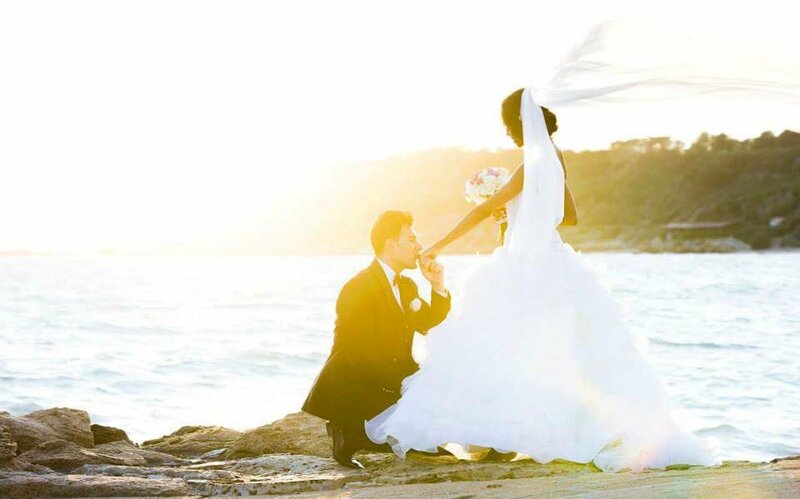 We originally planned on getting married in the U.S., but with all the Italian traditions and expectations, we switched it in having a destination wedding in Italy, where he lived. In America, most weddings are about eating a little and dancing the night away. In Italy, it is quite the opposite. Weddings are all about eating. Traditionally, they begin at 11 a.m. and end at 3 a.m. It is an all-day celebration of a union with lots of munching. Usually, there are about 6 to 8 courses, not including the buffet of appetizers. Note: an Italian portion is super big. So when seeing the cost of an American wedding and what we would be getting in return as far as food and not including wine, we would be spending a ton of money for little in return. 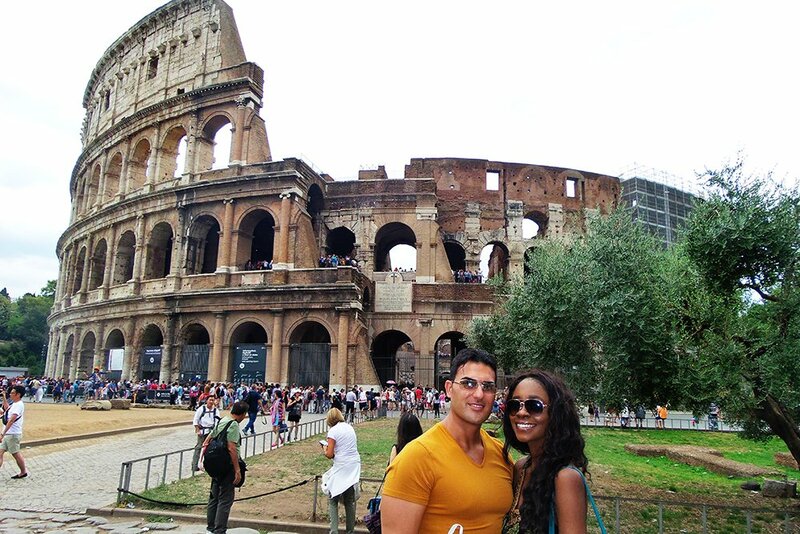 With the wedding we had in Italy, we received so much more and it ended up costing less. So, we had our wedding in southern Italy. My friends and family from Italy, Paris, U.K., Spain, Canada, and the U.S. flew down to witness our union. They said our wedding in his small hometown was the wedding of the year. We combined traditions throughout the entire event, from the wedding ceremony, reception, decoration, and music: it was an international melting pot. 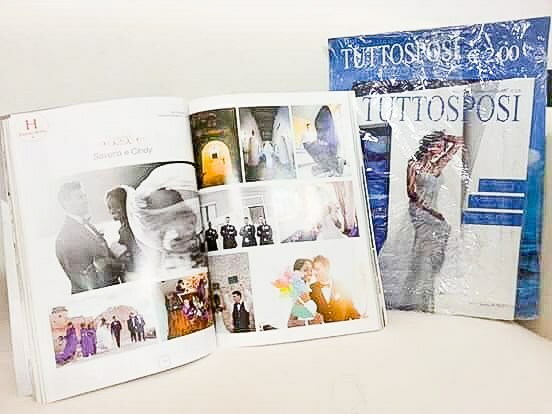 In fact, our wedding was featured in two Italian wedding magazines. We were the first interracial and international couple in his town as well. With all my family arriving, no one could not help but notice the new faces, accents, and skin tones. One of my most memorable memories from that day was a tradition after the ceremony. He surprised me with a horse and carriage before the ceremony, and after we rode it around town. A few cars drove ahead of us and continuously honked the horn. This let everyone in town know that the bride and groom will be passing by soon. So everyone went outside to their balconies, windows, and doors, shouting greetings and congratulations. Auguri, auguri! I was quite amazed to see so many people actually waving and cheering as we drove past. I began to learn Italian in at the end of 2007 using Rosetta Stone. I first discovered the program from a radio commercial I heard during my lunch break. I requested a free demo CD—now it’s totally online—which included Turkish. To my surprise, I learned a few words in Turkish very easily and decided to buy levels 1 & 2 in Italian. The program was very interactive and I love the voice recognition engine, where it knows if you are not pronouncing a word correctly. The way the program is set up is to teach you a language just like a baby learns its first language. You don’t learn conversations or a lot of long sentences upfront. You also could not skip to the section where you did learn phrases because each lesson builds upon the previous lesson. Knowing this is what caused me to become addicted to Rosetta Stone. I really wanted to have full conversations with people, but I couldn’t skip any lessons. So I would go on Rosetta Stone 2 to 3 hours every night so I could get to a new section and a new level, which would get me one step closer to learning full conversations. The result? I became somewhat conversational within 6 months. In May 2008, while vacationing in Miami, I quickly recognized the Italian language being spoken everywhere I went. I did not know so many Italians lived in Miami and I had visited there a few times before. The true test of my Italian came with my first trip to Italy for a special international convention in Rome in August 2009. I went with friends and I actually was able to translate for us several different times. The Italian people were very impressed. I still made mistakes, like when I accidentally asked an older Italian man to dance with me. I thought I asked him if he could dance for me again for the camera. Later, I found out the Italian song that we danced to was a bit naughty. No wonder why everyone stopped and cheered. Being there, I found the desire to really embrace this language and spend more time in Italy. After that trip, an opportunity came up where I would do some volunteer Bible education work in Italy for three months. I was so excited to be able to really put what Rosetta Stone has taught me into good use. In June 2010, I temporarily relocated to Pescara, Italy in the region of Italy called Abruzzo. This region of Italy is not as famous as Rome or Milan, but it has the best of both worlds: city, beach, mountains, and countryside. I loved it there. I lived with friend that I met in 2009 who only spoke Italian. Not a lick of English. This was the perfect situation for me to be in to truly put the language to the test. I began to pick up more and more Italian while living there. In fact, the strangest thing happened on the 5th day of being in Italy. My dreams became silent. It was like a silent film for two days. After that, I began to dream in Italian. It was the coolest experience ever. To this day, I dream in both languages. While in Italy, different people kept complimenting me on how proper my grammar and writing in Italian was. They could not believe how well I spoke, stating I spoke better than most Italians. They were quite astonished to know that I learned the language from a CD. So the moral of this story is that you never know where learning a new language can lead you. It could lead to lasting friendships, many Italy vacations, or even finding amore. Want to start an Italian journey of your own? Try Rosetta Stone now. I loved reading your love story! That’s fantastic that you were able to fluently speak Italian within 6 months and that you and your husband still speak it. Your wedding photos are absolutely gorgeous and if I choose to learn a language in the future it will definitely be with Rosetta Stone!